As you already know, I went to one of Earth’s magical places: Venice! Keep reading to find out more about my trip (plus great photos!). Venice is known for its beautiful Renaissance masks and clothing. The whole city is packed with all kinds of different masks, mostly handmade and sooo beautiful! There’s also an annual carnival, when people from all over the world recreate the mid-century atmosphere in Venice, wearing typical masks and costumes. 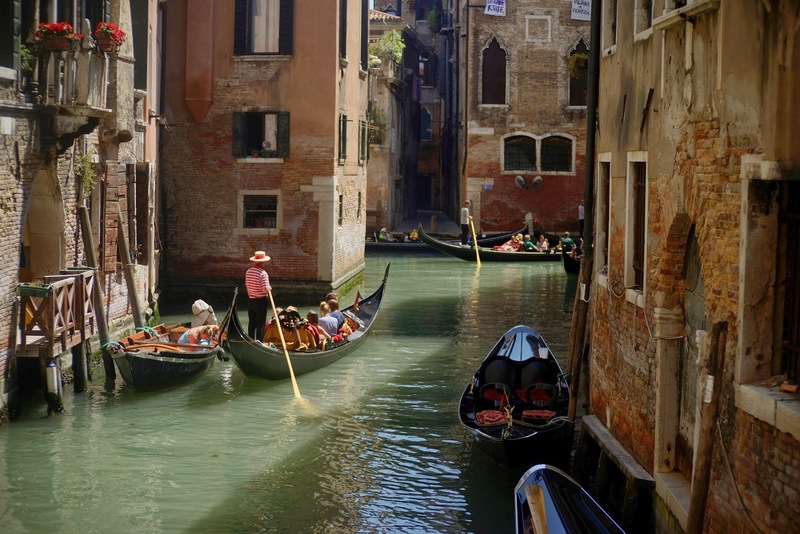 Canals and gondolas are everywhere, making the city such a wonderful and romantic place! Especially during sunset and in the evening the whole city transforms into a fairytale! Music is always playing on Piazza San Marco, people are dancing… you can feel the centuries of history of Venice! Stay tuned for a follow-up post, where you will find out which is my all-time-favourite place in Venice! Great pictures you look stunning–where are you followimg me by i did not get notification showing you following me –As soon as I do I will follow back ok doll. Amazing pics…. I love Venice!!!!!! Those pictures are beautiful! You look stunning in this look! I miss Venice. Hope I could visit it again soon. I've followed you back, btw. Let's keep in touch! Love Venice, is one of the most beautiful places I have ever been! Amazing photos!! I've been to Venice, but a looong time ago….these photos make me want to go back! Such a gorgeous place and great photos! I hope one day I get to visit! I've been in Venice once as a teenager and don't really remember that much so I have huge craving to go now after seeing your photos! Great images and you're very pretty. 🙂 Appreciate your visit on my blog and I'm following back please. Looking forward to more posts. Stay Bless! I always thought that Venice was the most postcard-like, photogenic place I've ever been. Literally every single place you look makes a beautiful photo. Seeing these makes me want to go back again!! How beautiful photos!I went to venice a month ago,it was perfect! Gorgeous photos! This is such a magical, lovely place. 🙂 Have a nice day! Great post and thanks for sharing. You look awesome here! I'm also your newest follower and look forward to your next post! Amazing photos, and I love your outfit! Enjoy your stay in Venice, I've never been there but it looks and sounds like such an magical place! O.M.G! These pictures are amazing. So clear! Great camera. You look great too. I would like to visit there. Looks pretty awesome. Venice is one of the most spectacular and romantic place in my Country! Venice is soooo beautiful, i really wanna go there again! Your photos are amazing! Love the lightning! davvero belli questi scatti ! I would like to go there one day. Lucky you ! AMAZING! I really want to visit Venice in the future, i hope so! Every single thing is so beautiful to be described.